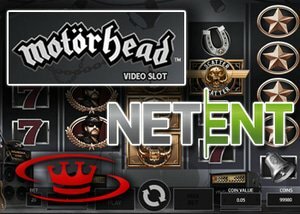 NetEnt software, a leader in the development of world-class online games, has turned up the volume once again with Motorhead slot. This new NetEnt slot is the third and final installment in their rock series of slots that pays tribute to rock bands of significance. The previous two online video slots released in the trilogy, Jimi Hendrix and Guns N' Roses, have already been successful releases with customers of the NetEnt software due to the high quality of game play, soundtracks and overall designs that show band members and the various tools of the trade that helped make them successful bands. With the release of the Motorhead slot, players will have the ability to remember the legendary music of bandmates, Ian 'Lemmy' Kilimister, Phil Cambell, and Mikkey Dee. Included in the game are some of the band's most iconic songs like Overkill, Iron Fist, Ace of Spades, and Killed by Death. These can be enjoyed when activating "Rock Mode". The slot has been designed with 5 reels, 76 lines, and includes a Mystery wheel, free spins and a wild symbol. It includes a variety of symbols with several being noticeably dedicated to the band. Designed with a black background, speakers, guitars, mic stands and stage lights. Simon Hammon, Chief Product Officer of NetEnt, comments: "The NetEnt Rocks tour has rewritten the rules for branded games, with Guns N' Roses and Jimi Hendrix exploding onto centre stage this year. Now, our customers can crank up the volume once more with the launch of our slot based on the iconic gaming song Ace of Spades, which we're sure will capture player's imagination yet again." For those who love rock'n'roll, this is one slot not to miss, especially fans of Motorhead! You can play this slot at Slots Magic Casino and enjoy free spins today!